Next time you're suckling a Singha in Bangkok's raunchy Patpong District, make sure you take a good look at your koozie, because it could be worth a fortune. 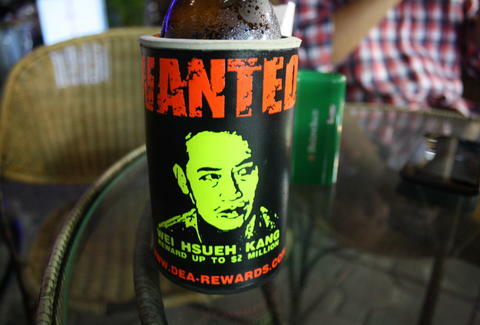 That's because the US DEA and Thai police have taken a page out of the milk carton book and started using beer insulators to advertise most-wanted rewards. Spy the ethnic Chinese fellow above -- a high-ranking member of the United Wa State Army, which runs heroin operations along the Thai-Burma border -- and you could be looking at up to $2,000,000 US. Even if you end your night seeing nothing but beautiful women who might actually not be, drop the bar a few baht and you'll still walk away with a stylish neon boozing accessory whose art you can seamlessly appropriate for your 1980s punk band's tour t-shirts.